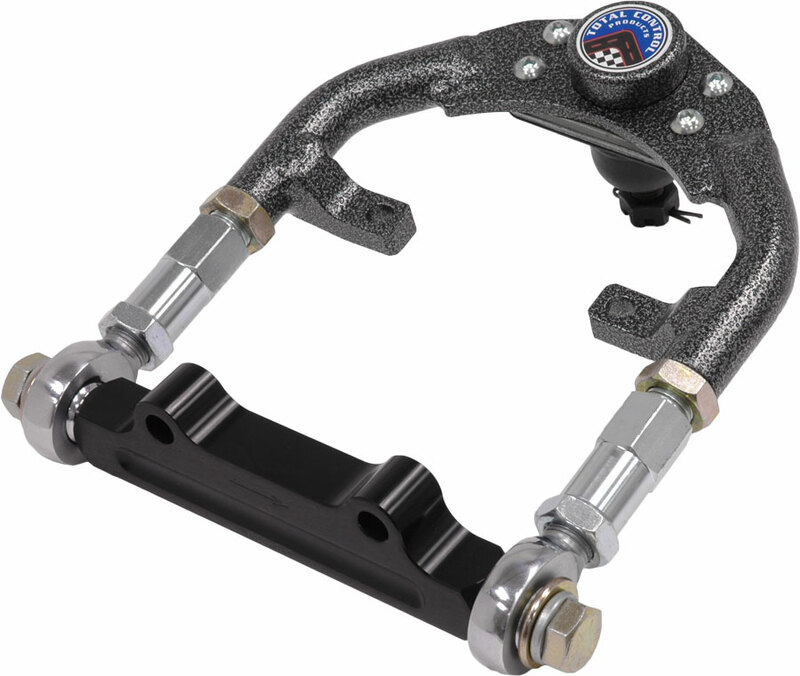 The most notable feature of our upper control arms is the double-adjustment couplers. Adjustment range is 1, with travel centered at the stock control-arm length. 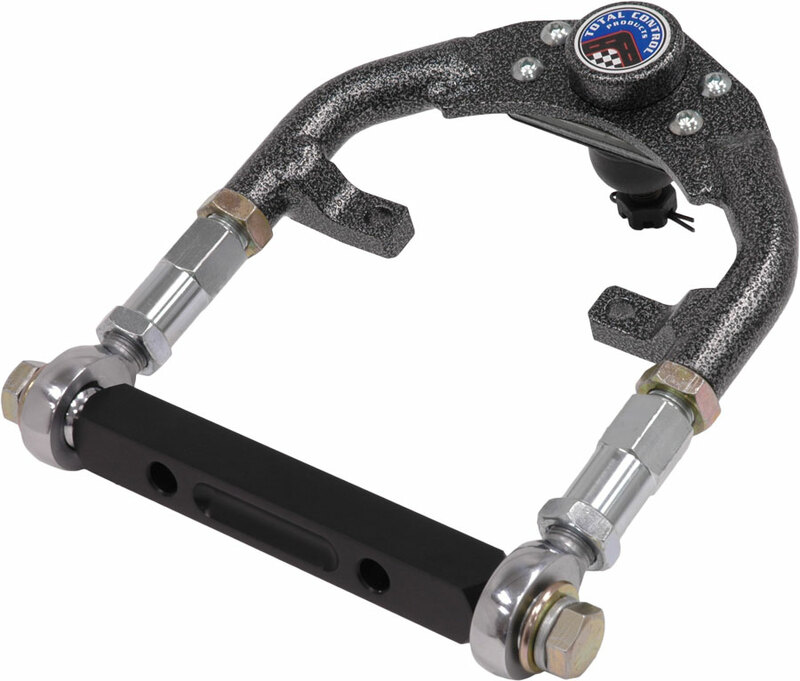 Caster can be varied within a 6-degree range and camber within 5-1/2 degrees. Alloy-steel rod ends feature low-friction, polymer-bearing races, eliminating deflection and the increasing resistance found with rubber and polyurethane bushings. New dropped pivot shaft, Mark II design eliminates the need to drill the shock tower to obtain the advantages of higher camber gain. Grade-8 fasteners secure the rod ends to the aluminum pivot shaft. 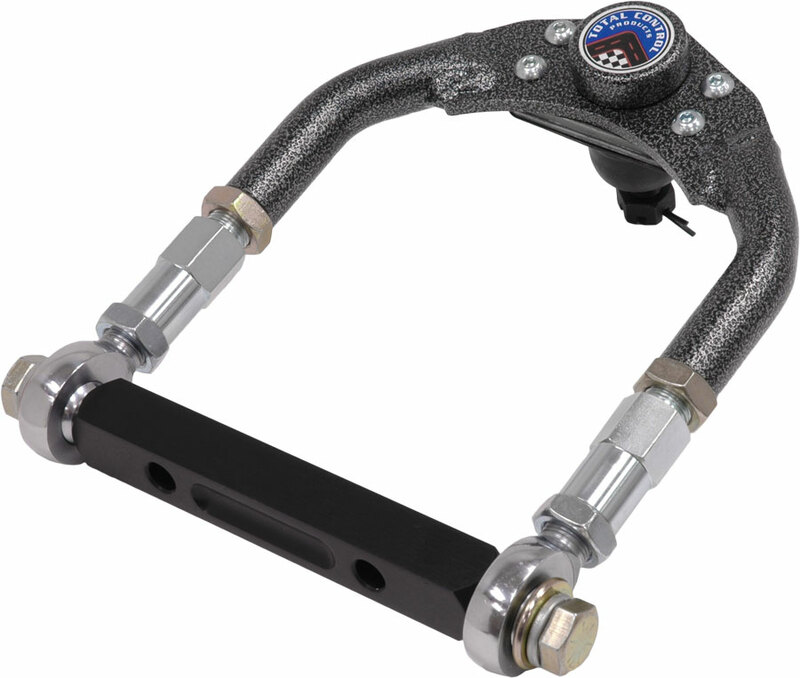 The 1-lowered mounting position improves negative camber gain and vehicle roll rate. Shim sets are provided to compensate for any major chassis variances. Each arm is constructed of 1 x.156-wall steel tubing with direct threads to the adjustment coupler. The broad, crimped end is robotic-spray-arc-welded to a ¼ steel bracket. 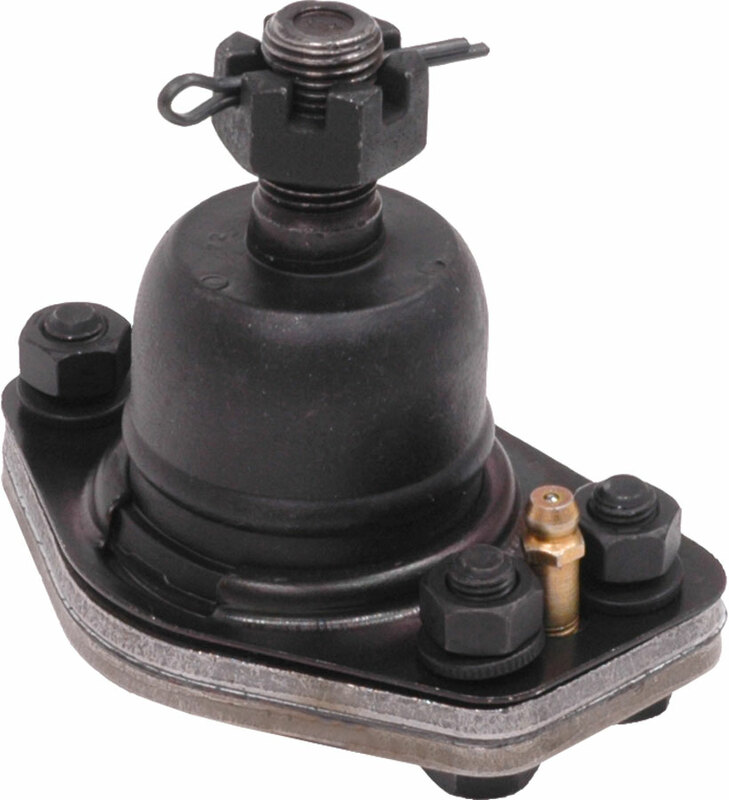 The 4-bolt balljoint relocates the zerk fitting for easier access and allows a lower-profile bump cap to net a ¼ increase in suspension travel. New dropped style UCA and original straight pivot shaft UCA are available. Arms are shipped fully assembled and include all necessary mounting hardware. 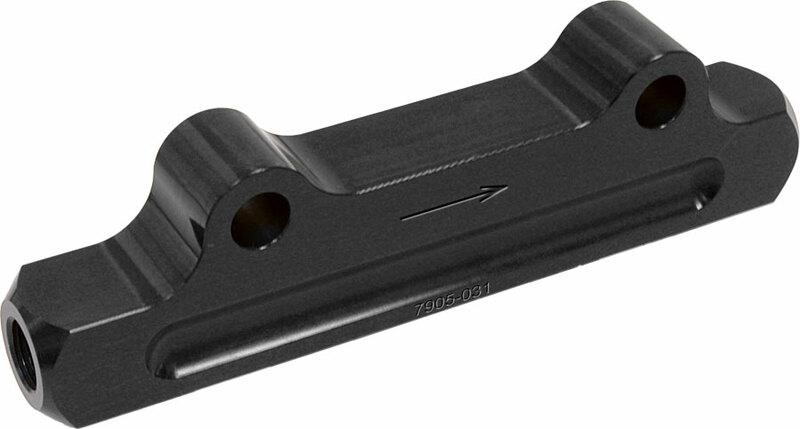 Direct replacement for OEM upper arm. Compatible with stock spring perch. For use with TCP coil-over conversion only. Sold as replacement part only. Replacement TCP or OEM upper balljoints. Includes mounting hardware, rubber boot, and zerk fitting. 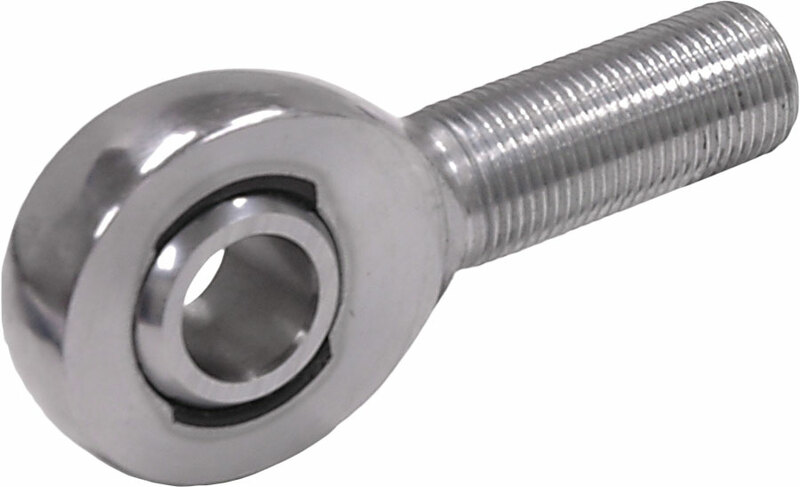 Replacement rod end for TCP upper control arm.